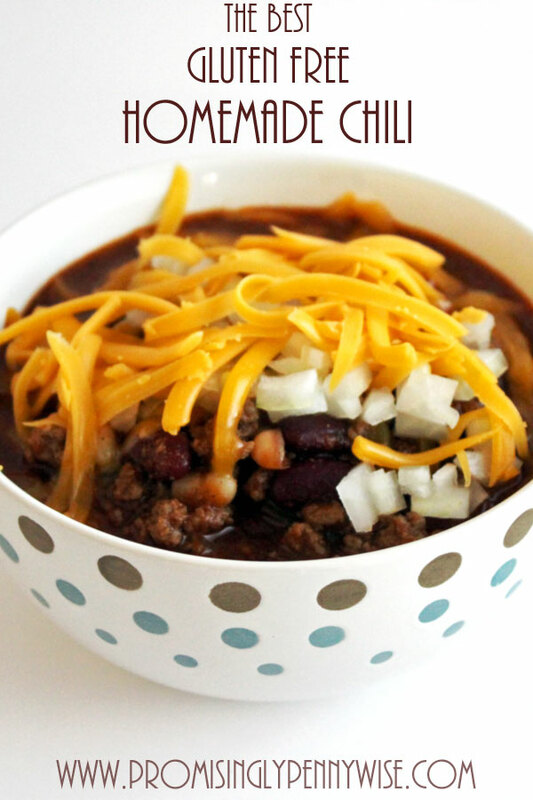 The Best Gluten-Free Homemade Chili: A flavorful, easy, one pot meal. 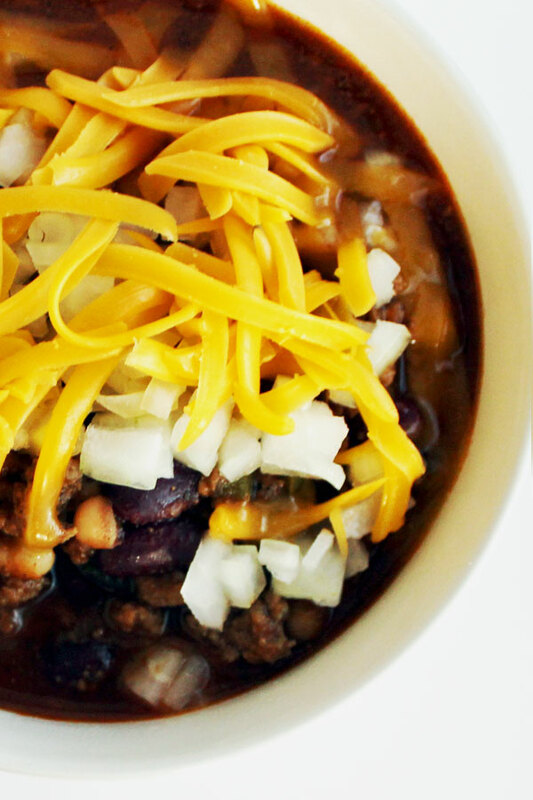 Not all chili is created equal. Not all chili is gluten-free and delicious. My granny’s chili was one of my favorite meals growing up- especially during the few rare moments of cold weather we happened to get here in Florida. When I developed gluten intolerance after G was born, I knew I’d have to create a flour free version. It didn’t take much to alter the recipe, and the first gluten-free version I made was pretty good. Then, Gary decided to add just a few additional spices and the end result was amazing. A comforting, filling bowl of delicious, gluten-free chili. Though we may not see truly cold weather here until January, a fellow blogger pointed out that chili is the perfect one pot, easy dinner for Halloween night. I don’t know what Halloween is like in your neighborhood, but here it gets kind of crazy. Last year we had over 500 trick-or-treaters stop by our house! This year, I plan to get a pot of chili simmering on the stove long before the trick-or-treaters arrive. Then, Gary, G and I can grab a bowl whenever we get a chance. And just maybe we’ll be lucky and get a cold snap for the big day! Place beef, onion and garlic in a large pot and season with salt and pepper to taste. Brown beef and drain excess fat. Return beef to pot and stir in chili powder, cumin, oregano, cayenne, salt, sugar, onion, green pepper, tomato sauce, water and bay leaf. Cover and simmer, 45 minutes. In small bowl, stir 2 TBS water and cornstarch until smooth. Add beans and cornstarch mixture to the pot and stir. Cover and simmer 30 additional minutes. 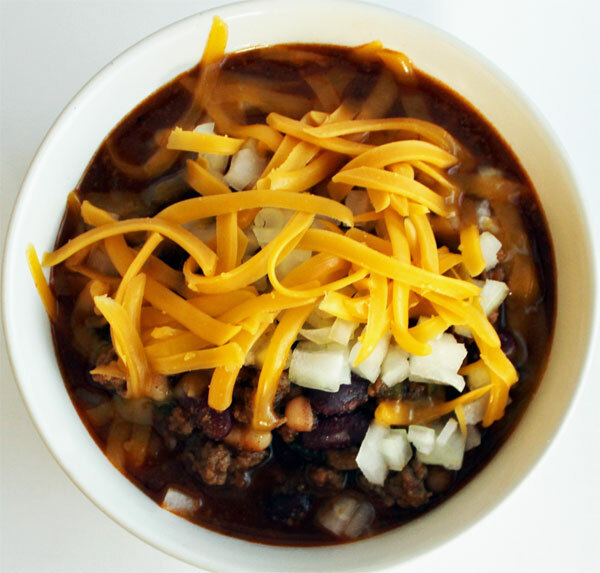 Don’t miss the Blogger’s Best Chili Cook-n-Share happening now! Click here for a list of over 15 delicious chili recipes! This chili looks and sounds delicious. I have not seen cornstarch used in chili before I am curious what its purpose is. Thanks Tina, it is! Some, but not all, chili recipes call for flour. The original recipe my grandmother used to make called for flour to thicken it slightly, so the cornstarch takes it’s place. Thanks Susanne! I hope you enjoy it. Sometimes I wish we had more cold weather, but then I remind myself that I’m lucky not to have to shovel snow! Thanks for pinning! I was intrigued by your gluten free title. I was trying to figure out what would have gluten in it. Now, it makes perfect sense- your family added flour!! Looks super delicious! Can’t wait to try it! It looks do yummy and will be sharing with my Aunty who is celiac and always looking for new recipes to try! I hope you and your Aunty enjoy it! I love chili cook offs! Hope you have fun! We are huge chili lovers around here, and I like to take it to potlucks sometimes. I love that this recipe is gluten free, so I can please everyone at any party we attend! Thanks so much for this, it looks fabulous! Chili makes a great potluck food! I hope you enjoy it! A different flavor added in this…oregano! Looking forward to trying this one out. I will let you know how we love it. Looks so good. This looks amazing. We use gluten free Masa to thicken our chili. I’ll have to try masa! YIPPPEEE for Gluten Free!!! Can’t wait to try your recipe. My mouth is watering!!!! Hi Rachel, awesome gluten free recipe. Just starting to eliminate gluten from my diet, so this is great! I hope you enjoy the chili!